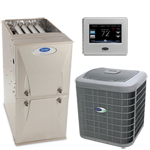 We are an authorized Bryant dealer and also install a variety of other leading brands of residential and commercial heating and air conditioning furnaces, air conditioners, boilers, heat pumps, humidifiers, air cleaners, water heaters, rooftop units, ductless split AC units and many more top quality products to accommodate any of your heating and air conditioning service, installation or replacement needs. When it's time to replace your home or business heating or air conditioning system you need to work with a HVAC professional service and installation company that understands the areas of your home or business needs. You need a HVAC contractor you can trust to properly evaluate your heating and air conditioning equipment sizing, knows the best possible comfort solution, and will install correctly per manufacturer specifications. We want you to call air joe heating air conditioning. Free in home heating and air conditioning efficiency evaluation and replacement cost proposal. We promise to take care of your home or business. Our professional Nate Certified HVACR, service, installation and repair technicians are trained to get the job done right - the first time! We are the industry experts on residential and commercial heating and air conditioning, service, installation, repairs and equipment upgrade, replacements. So give us a call today to help assist you with your HVAC replacement needs.